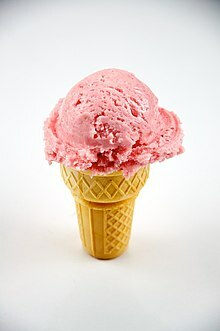 An ice cream cone, poke or cornet is a dry, cone-shaped pastry to hold ice cream. It is usually made of a wafer similar in texture to a waffle. Ice cream cones let you eat without a bowl or spoon. Different types of ice cream cones include wafer (or cake) cones, waffle cones, and sugar cones. This page was last changed on 15 November 2017, at 09:02.